The numbers alone are impressive: nearly $3 million raised in 2019, more than $27 million overall, some 3,000 student participants, and more than 950 families served. Many in the University of Iowa community are at least somewhat familiar with what Dance Marathon does. It’s a student-run organization that raises money to support pediatric oncology patients and their families at the UI Stead Family Children’s Hospital. The yearlong effort culminates in “the Big Event,” a 24-hour dance marathon held each winter at the student union, where they reveal the amount raised in the previous 12 months, celebrate young cancer survivors, and remember those lost. Throughout the year, students donning lime-green Dance Marathon T-shirts frequently are seen busking for change on the Iowa City pedestrian mall or entertaining a crowd as they perform a flash mob on the Pentacrest. They maintain a regular and reliable presence as volunteers at the hospital, playing Monopoly or shooting Nerf guns with young oncology patients and giving their families badly needed respite. The commitment doesn’t stop there. The students plan field trips to theme parks for the patients and arrange summer camps. They run the Chicago Marathon because if children can spend their days in a hospital fighting for their lives, they can push themselves to run 26.2 miles and bring in a few more bucks to the cause. Dollar by dollar, sometimes quarter by quarter, the students solicit donations in Iowa City and in their hometowns, door-to-door, and online. 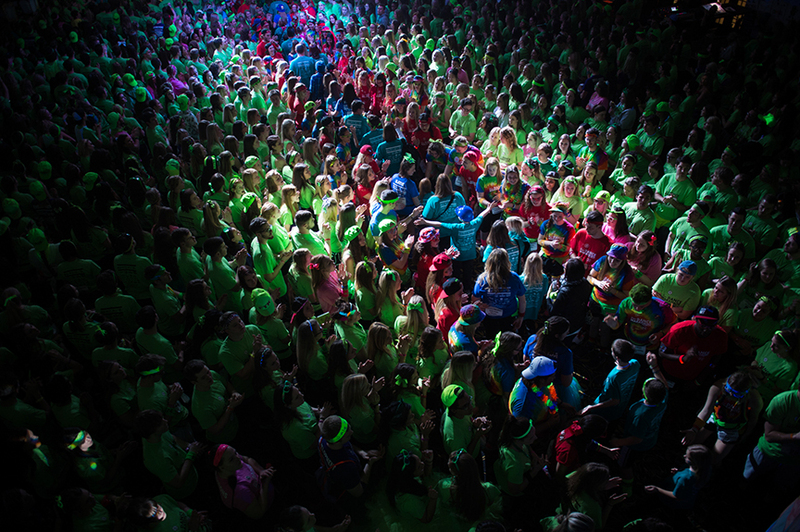 As the Dance Marathon mantra proclaims, these efforts are “for the kids,” or FTK. But since the organization first formed on campus in 1994, under the guidance of the Children’s Miracle Network, its role has evolved. The money raised continues to fund things like gas cards for families who travel long distances to seek treatment, purchases of laptops and tablets for patient use in the hospital, tuition scholarships for survivors who enroll at the UI, and much more. But in recent years Dance Marathon’s student leaders have set their sights higher, making multimillion-dollar contributions that aim to advance science and conquer pediatric cancer altogether.